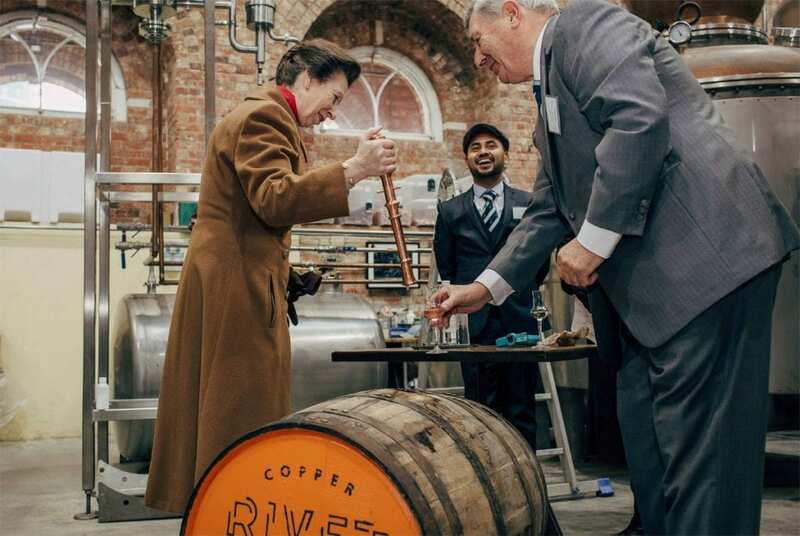 On Friday 1st December, HRH The Princess Royal officially opened Copper Rivet Distillery in Chatham’s Historic Dockyard. The three founders, Bob Russell and his sons Matthew and Stephen welcomed her to their beautiful distillery before introducing her to the team. 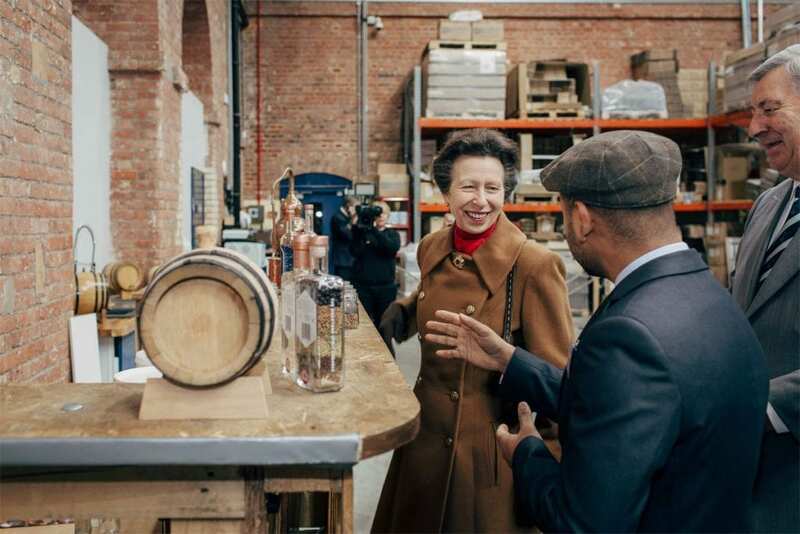 During the tour, The Princess Royal tried her hand at using a copper ‘valinch’ to extract barrel samples of the maturing Masthouse Whisky, which will be ready for release in 2020. Copper Rivet Distillery is one of only very few distilleries to control the whole distillation process from grain to glass. In addition, it has agreements with local farmers on the neighbouring Isle of Sheppey to grow their ‘Holy Trinity’ of wheat, barley and rye so as to let them control every aspect of the flavour of their spirits. Copper Rivet Distillery opened its doors in October 2016 and since then has gone from strength to strength. Its Vela Vodka won the top Double Gold award in the San Francisco World Spirits Competition; its award-winning Dockyard gin has had the honour of launching HMS Medway, the first ship ever to be launched with gin; and its Son of a Gun English grain spirit, finished in oak barrels, is pioneering a new drinks category for Britain’s ever more inventive army of mixologists. 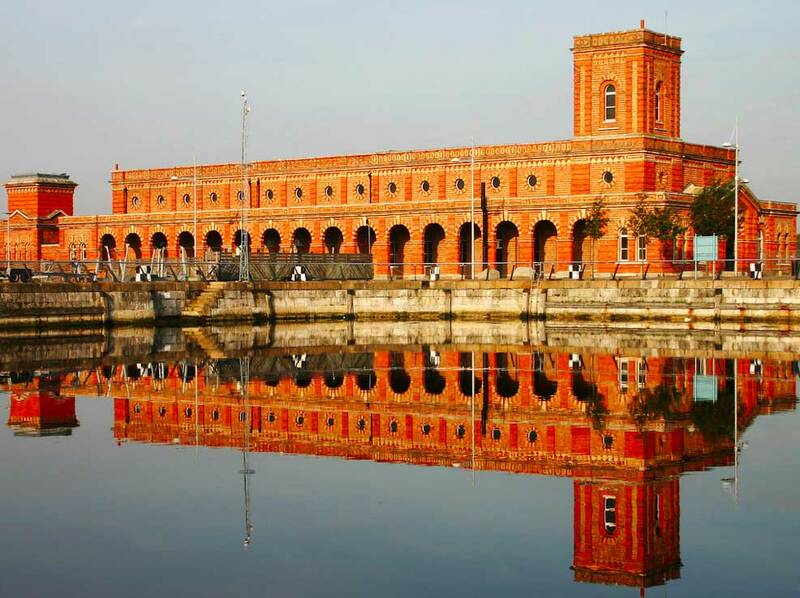 10,000 visitors have already visited the distillery and its delicatessen area on the increasingly popular tours.